2 years ago, I made my first oreo cheesecake. 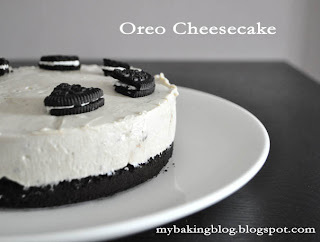 Recipes for oreo cheesecake are all over the internet, but I tried one from Kraft, whom I thought I should trust, since they make the cream cheese. There was no regrets in that choice. Last week, for some reasons, I decided to make it again. I gave it to my good friend who actually celebrated her birthday 1 day before met up. For Chinese, we have this superstition that we cannot celebrate our birthday after it has passed. We can celebrate before the day, but not after the day. It doesn't actually sound logical. Say your 43rd birthday is 10 Dec, and for some reasons you celebrate it on 5 December. In between 5-10 Dec, if anything unfortunate happens and you have to leave this world (*touch wood*), you have not actually reached 43! Anyway, it is a taboo thing and no one questions it. That explains the lack of wordings on the cake and no mention of any reason when I passed the cake to my friend. No-bake cheesecakes are so simple they just can't go wrong much. This time though, I reminded myself to beat the cream cheese till really smooth, unlike my first try. Do not make the same mistake as me. Beat the cheese real smooth. So there goes, a smoother and neater looking cake, though the edges could have been better. The recipe can be found in my recipes blog here. So many old posts on my blog are in major need of photo redos so I feel your pain! This cheesecake looks amazing...at least you got to remake something truly delicious!